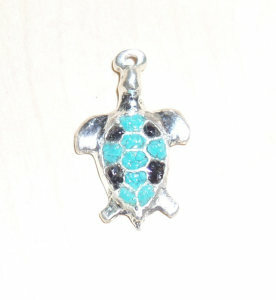 The turtle is also linked to the spirit of the water and the fluid nature of emotions. This is a very neat turtle shape that I created. The oval piece is a Black Tiger Eye. This Tiger Eye looks amazing on this piece since it contrasts well with the deep rich color of the .999+ pure silver. The eye “follows you” as your view change angles. Really cool. I can put any kind of gem there just ask! A real gem, a synthetic, a hole(looks cool) or nothing at all. I make two versions basically. One with the pointed rear feet and one with rounded rear feet. I can forge and shape the front legs to different configurations a little too. The picture does not do it justice but, I am diligently working on that photography issue. On the right is my second one which, still had not been fully shaped and polished yet. 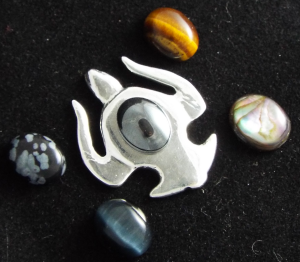 I was placing different colors and types of 10mmx8mm cabochons on it for reference. I wanted to create a turtle that a man would also wear considering some musicians wear my items on stage. A little dangerous, pointy and flowing with a dark center without being “frilly” at all. Here are five stones that I think all look great. The one on top is a natural Tiger Eye. The Abalone Shell is down and to the right. On the bottom left you will see the Black Tiger Eye which does not occur in nature hence, man made. The spotted one is natural Snowflake Obsidian. Finally, the one in the center is Hemalyke which is man made, very deep, lustrous and consuming black. You may notice this piece is not yet completed. The hole is not drilled and polishing is not yet completed but, still a beautiful piece. This one is actually the thinnest I have cast at about .040″. This piece was a challenge for sure. 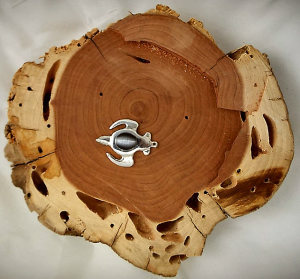 This silver turtle (right) is quite amazing. After I made it, I crushed Red Coral and Turquoise into small pieces. I then in-layed the pieces into each small area under a 20x microscope. There is 8 to 12 stones in each section totaling over 100 stones. I then use a water clear jewelers clear to encapsulate the stones. THIS TAKES HOURS to create this piece that is about the size of a nickle! This (left) is the first one I made while in process. I crushed Black Onyx and Turquoise. In this overexposed shot, you can see the individual stones. I still had to carve out the front legs and finish the back ones. I do all of the silver shaping and polishing before in-lay now but, my first one was exciting and I got distracted. 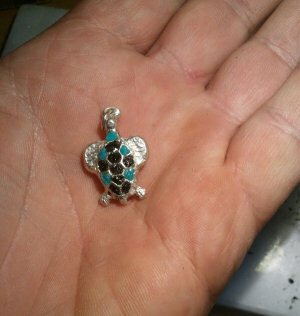 Here is one of my first inlay turtles before final smoothing and sealing. Looks a lot different when done. I did this one back in early 2013. 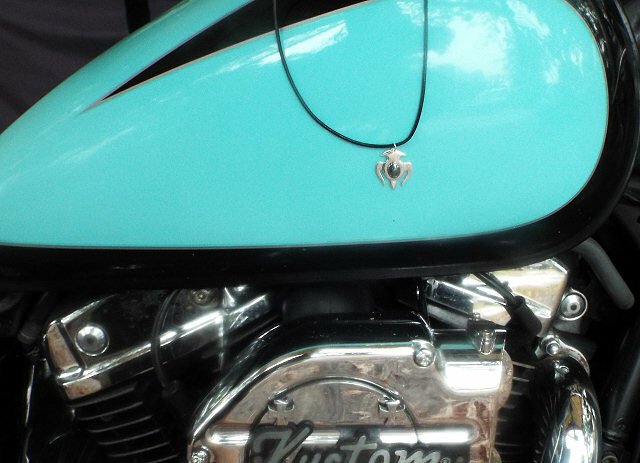 Notice the cross shape in the Black Onyx stones and the Turquoise background. Many many hours under a 20x microscope to make this one. Just making the mold was pretty intense as it was so small and I needed to retain the 12 concave sections to hold the stones. Each section is only about 100 thousandths of an inch which is enough to hold 10 custom shaped stones each section! This is for a lover of music. Inverted is for a player. 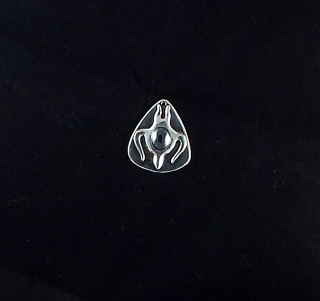 My latest one off is a swept back turtle abstract on an inverted guitar pick. The turtle design I created was inspired by music so, I designed it to retain a “guitar pickish” shape and lines. I was casting one of my turtles when something went awry and the item was seemingly ruined. I set it aside and moved on to another two hour mold set up for another piece. The next day I re-visited the “failed” casting and decided to grab a torch and modify some areas. This was a daunting task as this is a “large” piece and much heat is required. The piece must actually go molten before I can attach more silver. This typically results in a nice indistinct ball of silver. You see, silver pretty much goes into a sphere when melted, it does not conform to a mold on its’ own and must be forced into a mold cavity via gravity or pressure. An hour or so later while filing, I just happened to set the piece down next to a guitar pick. I saw the marriage of the inverted pick with the turtle inverted against the lines previously envisioned. I am happy and so is this piece. Sorry! I have to go make silver pieces instead of web pages! 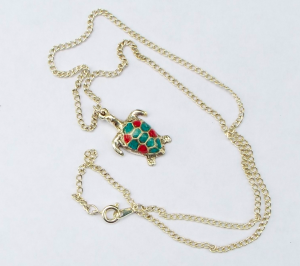 This page will have my Turtle inspired items.